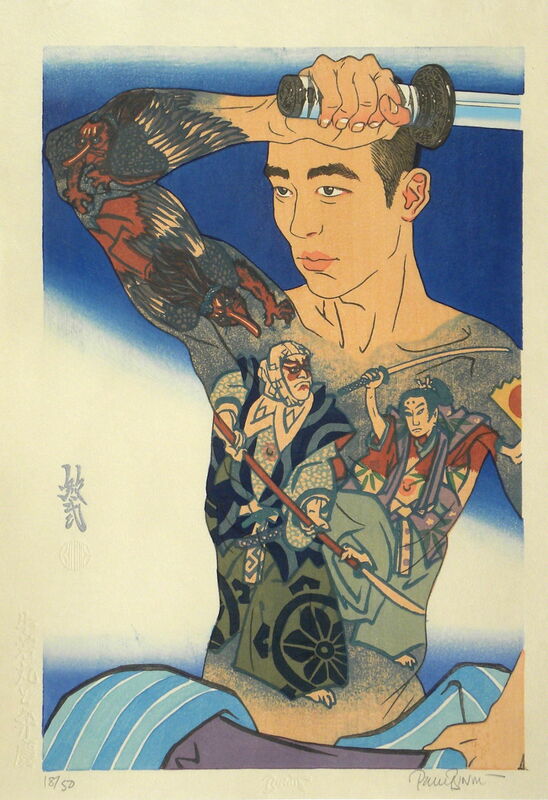 Ushiwakamaru to Benkei (Ushiwakamaru and Benkei) is a tattoo design made to fit with an Utagawa school print of male legs, separated from its upper half. My replacement upper half fits with my continuing interest in tattoo motifs and works rather well as a stand-alone design, plus the image of the two heros of medieval Japan is loosely based on a painting by Torii Kotondo. As ever, I like the model and his tattoos to interact in some way, so he is holding a short sword in a similar pose to Ushiwakamaru in the tattoo. Same model as used for Sharaku's Caricatures, Bang Bang and Umbrellas .